Label variant: left side of vinyl labels says just "Ⓒ 1972 Stein & Van Stock, Inc. (ASCAP) & Black Bull Music, Inc. (ASCAP)". "Ⓟ 1972 Motown Record Corporation" instead of "(P) 1972 Motown Record Corporation". 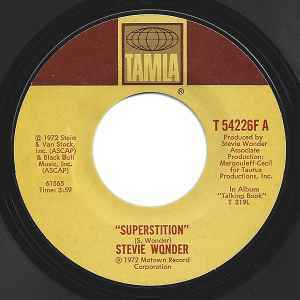 In Album "Talking Book" <a href="http://www.discogs.com/Stevie-Wonder-Talking-Book/release/174477">T 319L</a>.